Oh No! Someone got their hot little hands on the script for the new season of Breaking Bad. 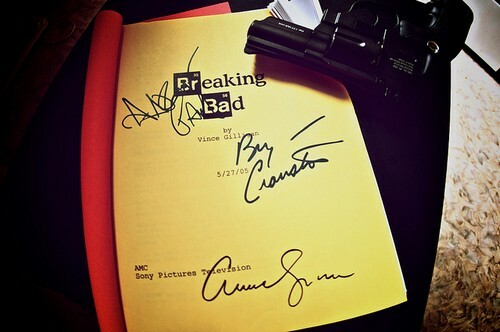 Someone broke into Breaking Bad star Bryan Cranston car in Albuquerque and got away with his iPad and the script. Those are some happy thief’s, they hit the jackpot. This would be the script for the second 1/2 of season five and the last season for the popular show. Breaking Bad is set in Albuquerque and is filming its fifth and final season in and around the city. The show follows Bryan Cranston’s character Walter White a former teacher producing and selling methamphetamine with a former student played by Aaron Paul called Jesse Pinkman. The end of season 5 is suppose to air Summer of 2013. I wonder if this means we will start seeing snippets from the stolen script get leaked to the internet. I hope not!